Similar to window tint, but surpassing it, this new dimmable window system also blocks 99% of UV radiation as well as much of the solar heat from coming into the airplane, making the flight more fuel efficient. We covered this technology before at Boeing’s Electronic Window Tinting blog article. The new airplane now is beyond concept, and has been shipped to Japan’s ANA airlines. 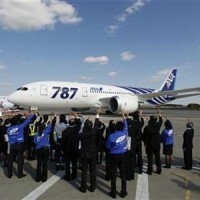 The verdict is in, 9 out of 10 surveyed passengers found the new 787 met or exceeded expectations. Although, there was a concern where the new electronic window tint system did not meet or exceed the old shutter system. When fully dimmed, the window does not reach 100% opaqueness. This is a concern for long-haul international flights where passengers are looking to sleep even with the sun shining. ANA Airlines is considering adding a shutter system in addition to the electronic tint already installed. There airplane design are so nice….system that allows airplane passengers to dim the window to their own custom level of darkness. It took a long time for us to get to where we are in the States.